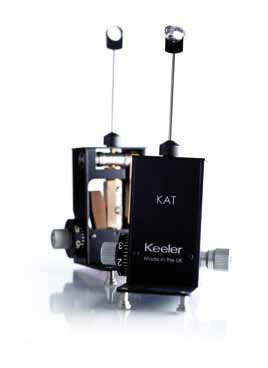 Reliable and repeatable applanation tonometry, the Keeler Applanation Tonometer (KAT) is a perfect example of British manufacturing experience delivering great quality and value. We have applied 21st Century design techniques to an old established principle to deliver a premium quality instrument. The KAT is made with precision machined components, subject to stringent quality controls pre, during and after assembly to add reliability and repeatability to an established technique. The take-away T type KAT is fitted to the guide plate on the optical axis for the microscope and illumination unit arm. The fixed R type is mounted on a post fitted to the microscope optical body. The BQ KAT is designed specifically to fit the Haag Streit BQ, BP and BX Slit Lamps and fits directly to the optics support arm. Our all metal parts, manufactured to a high precision engineering design will withstand the test of time and deliver reliable results year after year.